Champagne in 2019: What Can We Expect? In our last article, we looked back on 2018 and highlighted the biggest champagne news stories of the year, which included the most exciting new releases and the most memorable tasting events. In this article, we look to the future and discuss what can be expected from our favourite sparkling wine in 2019. As some houses prefer to keep their new releases undisclosed prior to launch, it is impossible to know every champagne set to hit the market over the next year. Therefore, although many of the champagnes below are confirmed releases, some of them are speculative, based on our predictions of when different vintages and house styles will be ready for release. The champagnes are presented in alphabetical order. Following the successive successes of La Grande Année 2005 and La Grande Année 2007 – generally considered to be amongst the best expressions of these two difficult vintages – Bollinger will likely release their next vintage of La Grande Année in April or May 2019. Hailing from one of the best Pinot Noir (and indeed, all-round) vintages of this century, we have high expectations for La Grande Année 2008. 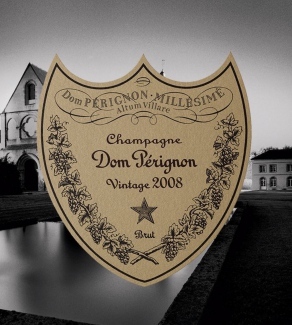 Receiving an average score of 18.4/20 at our recent comprehensive Dom Pérignon Vertical Tasting, it was the 8th highest rated champagne of the evening – an outstanding achievement considering its youth and elite competition. Those too eager to wait for the first shipment can contend themselves with Dom Pérignon Legacy Edition 2008, which was released in September 2018, although be quick – there are extremely limited quantities available. Rich fruit nose is quite forward, with that trade mark match-strike smoky character quite subtle. Smokey bacon and forward pineapple and guava are forward on the palate with underlying ripe lemons and bright red apples all wrapped around a texture from long lees ageing; Finishes very fresh and light, dances on the palate with a hint of that saline and twist of bitterness which really help balance the delicacy and finish. We also expect the latest iteration of Dom Pérignon Rosé, the champagne that wowed Jancis Robinson at our Dom Pérignon Vertical Tasting – “For me the revelation was just how wonderful the rosés were” – to hit the market midway through 2019. It’s been more than two years since Dom Pérignon 2005 was launched and it was an instant hit – and, incidentally, the first vintage produced under the auspices of new Chef de Cave Vincent Chaperon, who began making Dom Pérignon Rosé that year. We can’t wait see how his second vintage, Dom Pérignon 2006, tastes later this year. Last but by no means least in a year of big releases for Dom Pérignon will come the eagerly anticipated Dom Pérignon P2 2002. We were lucky enough to taste it at our Dom Pérignon Vertical Tasting with Richard Geoffroy and, as expected, it simply blew the room away. With an average score of 18.9/20, it was joint-third favourite champagne on the evening – quite something for a pre-release. Geoffroy also entered it into this year’s Champagne and Sparkling Wine World Championships (CSWWC), at which it picked up the gong for Best Deluxe Champagne Future Release 2018. When this arrives, likely in the first half of the year, it is certain to be in high demand. Yet another exclusive preview, this P2 has not yet been released, with 2019 looking likely. And it still got my (joint) highest mark. P2, Geoffroy says, “goes beyond Champagne”. The wine must be “inviting” and therefore marry gravitas and profundity on the wine side, with a playful almost ludic spirit on the other, thereby underscoring that inherent tension, conceptual and gustatory, which underpins the whole evening. P2, he says, must be “deeper, richer, longer… better than P1” … otherwise why release it? Jancis praises the “drive”, the vinosity and the length. The sweet and savoury indulge us in a seductive embrace: Gustav Klimt in a glass maybe. Outstanding. 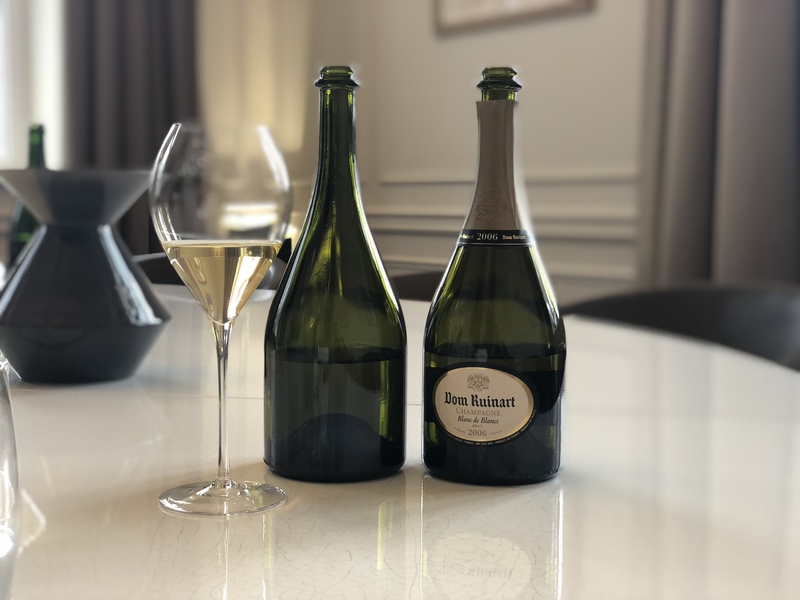 During our vins clairs visit to Champagne in 2018, we met with Ruinart Chef de Cave, Frédéric Panaïotis, who kindly shared with us an early disgorgement of their next prestige cuvée release, Dom Ruinart Blanc de Blancs 2007. 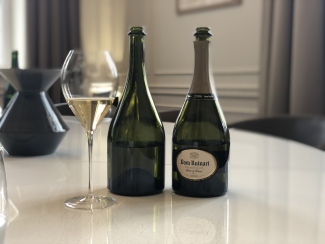 Other prestige cuvées from this good-but-not-outstanding vintage have been a pleasant surprise and with even more lees ageing and post-disgorgement maturity since we tasted it last year, Dom Ruinart 2007 is sure to follow suit. We’re expecting this one in the not too distant future. Hint of toffee and butterscotch with lots of that creaminess from vanilla and richness of tropical fruits. Does have a feeling that its mature already compared to the 2006. As always, a new year will bring a new Edition of Krug Grande Cuvée NV. With the previous two releases, Edition 165 NV and Edition 166 NV, being two of the smallest batches in the history of the house, new Edition 167 NV may arrive early than expected. Although Edition 167 NV will be based on a difficult vintage, 2011, Krug have an immense portfolio of reserve wines with which to bolster this champagne, which will undoubtedly be as rich and generous as all Grande Cuvées of the past. 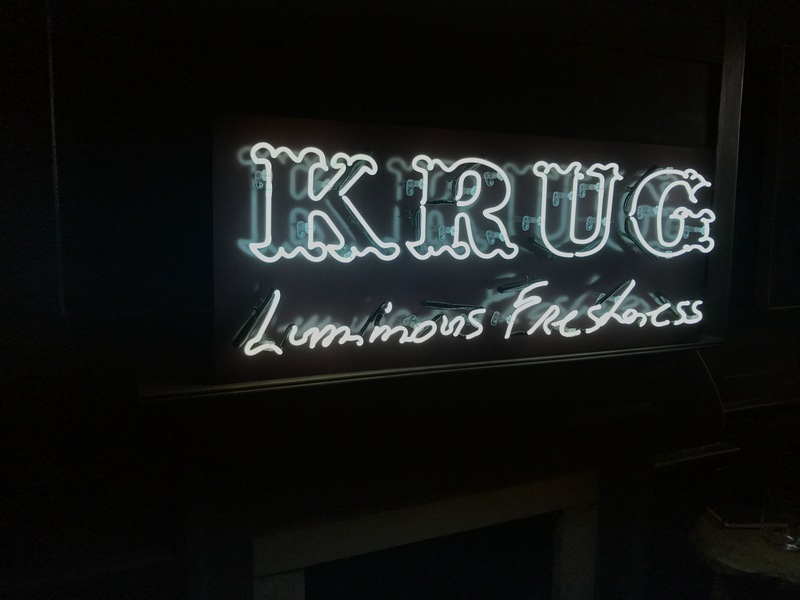 Krug launched their last vintage, Krug 2004, way back in September 2017. Given it has been nearly 18 months without any release, we are expecting them to skip the difficult 2005 vintage, and release Krug 2006 around springtime this year. 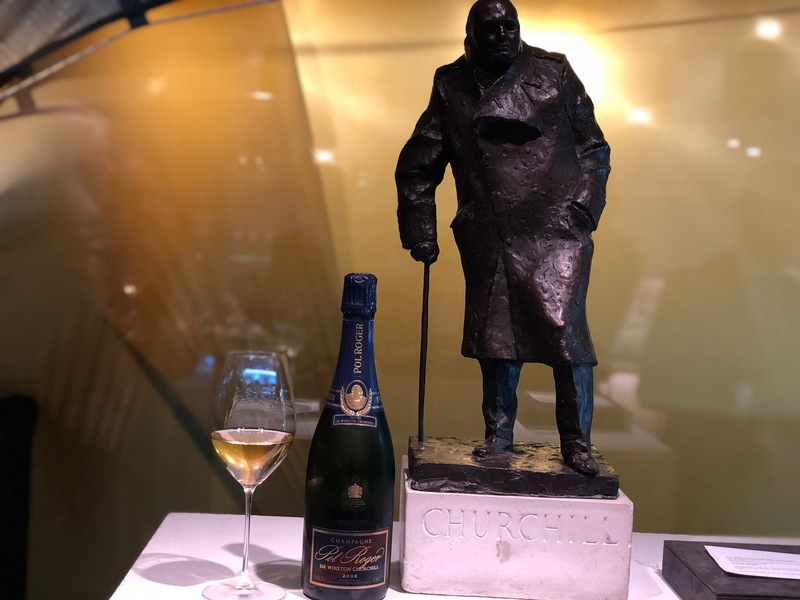 A new Krug vintage is always a cause for celebration and with the success other major houses have had with 2006, this is a release we’ll be keeping a close eye on throughout 2019. What with the pandemonium caused by last year’s Cristal 2008 launch, 2019 is likely to be a considerably quieter year for Louis Roederer as far as new releases are concerned. That said, there will almost certainly be a transition in vintage for their Brut Vintage champagne. Louis Roederer Brut Vintage 2013 will follow the small quantity, yet supremely high quality, 2012 vintage. We predict Brut Vintage 2013 to be somewhat similar to 2004 – much larger volumes than the previous year, whilst retaining the high quality for which the house is so revered. Speaking of the exceptionally high-quality 2012 vintage, Moët & Chandon Grand Vintage 2012 has already been released and will be available to purchase next week. Following the tremendously successful Grand Vintage 2009 and Grand Vintage 2008, we expect the latest iteration to complete a hat-trick of outstanding vintages for the house and, given 2012s reputation, it could very well be the best of the bunch. Sticking with the theme of 2012 releases, Piper-Heidsieck will also be launching their Vintage 2012 champagne later this year. 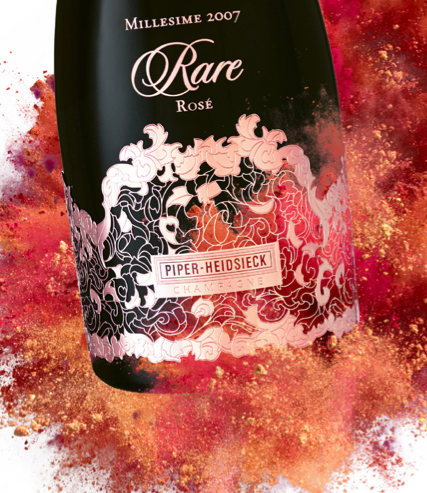 We’ve waited a while for a new release – the current vintage is still the spectacular Piper-Heidsieck Vintage 2008. It has big boots to fill but if any vintage can match or attempt to better 2008, it’s surely 2012. We’re expecting this one in March 2019. 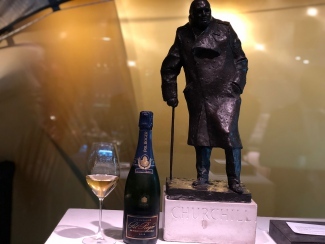 Although officially launched late last year and available to purchase now, there will be a second and final release of Pol Roger Sir Winston Churchill 2008 later in 2019, which will hopefully help meet the high demand for this groundbreaking champagne. The house describe it as “the best vintage since 1988” and we’re inclined to agree – a champagne worthy of two releases! Strong rich golden colour with plenty of grapefruit and ripe lemons accompanied with a soft chalky character. On the palate, ripe red apples come through with lots of lees character, with rich creamy notes through the mid palate. Great texture, lively acidity but balanced with fruit. The finish lingers long. There have been just eight vintages of Rare Champagne (not including new Rare Le Secret) in its entire history, the first release being Rare 1976 and the previous release being the outstanding Rare 2002. However, all indications point towards a new vintage arriving in 2019, likely around summertime. 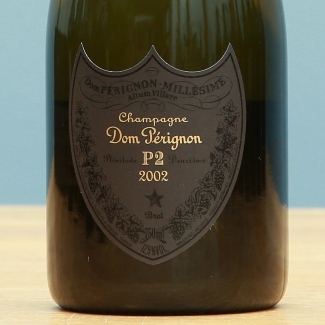 Rare 2006 will be the first vintage released since Rare Champagne became an independent brand (separate from Piper-Heidsieck) and promises, as the name suggests, to deliver something both supreme and unique. In 2017, Rare Champagne made history with the release of their first ever prestige cuvée rosé, Rare Rosé 2007. Every bit as seductive as its blanc counterpart, Rare Rosé was an instant hit, receiving praise from connoisseurs and critics alike, including a 97/100 rating from Essi Avellan MW. In May 2019, two years later, we’re expecting the release of the second vintage, Rare Rosé 2008. The marriage of Cellar Master Regis Camus’ ingenuity with the supremacy of the 2008 vintage is a thought to behold. This will be one of the most exciting launches of the year. Completing the array of 2008 prestige cuvée releases in 2019 is Veuve Clicquot La Grande Dame 2008. Another champagne released only in vintages that truly warrant it (2008 will be the just the third vintage since La Grande Dame 1998), this spectacular rarity can be expected in spring 2019. With all these new releases, you may be wondering how on earth you’re going to taste them all! Fear not, The Finest Bubble have a vast array of tasting events planned in 2019 – tailored to suit every level of champagne lover, from the new fans to the fanatics – and we will endeavour to include as many new releases at these tastings as possible. Keep up to date with all of our tasting events here. The first event of 2019 is our Range Tasting on Wednesday 20th March at Frederick’s, London. Whatever happens, 2019 is sure to be another exciting year for Champagne, with the confirmed releases alone sufficiently whetting our appetite. As always, we will be here with tasting notes and reviews of all the latest releases as they occur throughout the year. Be sure to subscribe to our mailing list to be amongst the first to find out. 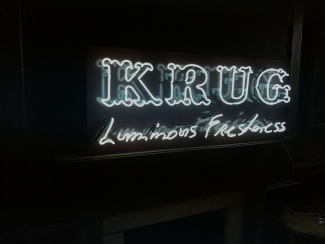 What will the latest vintage of Krug be called?